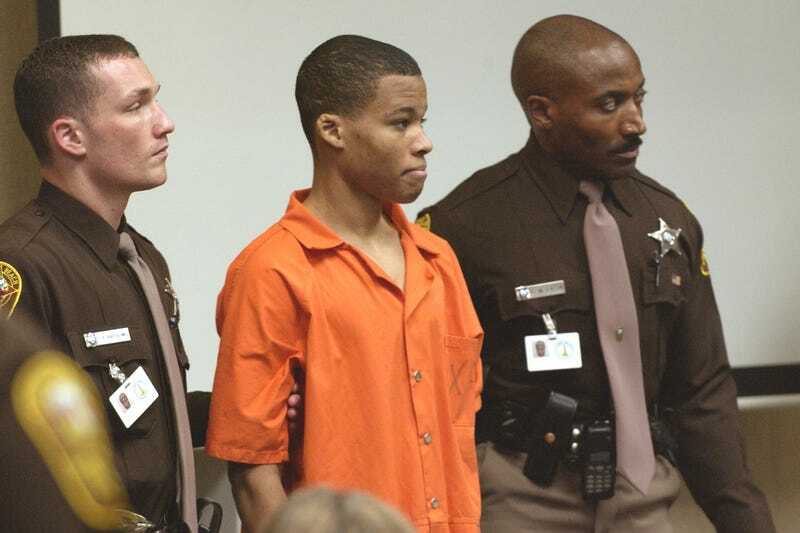 Sniper suspect Lee Boyd Malvo (C) is escorted by deputies as he is brought into court to be identified by a witness during the murder trial in courtroom 10 at the Virginia Beach Circuit Court October 22, 2003, in Virginia Beach, Va.
On Monday, the U.S. Supreme Court agreed to hear the appeal of Lee Boyd Malvo, who participated in one of the most notorious, murderous shooting sprees in U.S. history, to determine if he should be re-sentenced because he was a minor at the time of his crimes. In September and October 2002, 17-year-old Malvo and John Allen Muhammad, 42, dubbed the “DC Snipers,” killed 10 people and wounded several others in seemingly random shooting attacks in Virginia, Maryland and the District of Columbia. Muhammad was executed, but Malvo received sentences of life without parole in Virginia and Maryland. Malvo was 17 at the time, and the Supreme Court announced Monday it will consider whether Malvo’s sentence should be affected by a 2012 Supreme Court ruling that deemed mandatory life sentences without the possibility of parole for those under 18 unconstitutional in most cases, and retroactive. Muhammad, who was 25 years older and brought Malvo into the country illegally, was executed in 2009. At Muhammad’s trial in 2006, Malvo described how Muhammad clothed him, fed him, and made him “a monster.” Malvo said he shot three people and worked as the “spotter” in the other shootings. In Malvo’s case, the state of Virginia is appealing a 4th Circuit decision that said Malvo deserves at least a new sentence because the “corruption” clause was not considered. My .02? Even though it was obvious that Malvo was in fact “corrupted” by Muhammad when he was a minor, I would be quite surprised if the court ruled in his favor. Why? As with black and brown juveniles around the country who are criminalized from pre-adolescence, 17 is plenty old to be treated like a “man,” in the U.S. court system, especially if the victims of such crimes are white (which, in this case, they were). The Supreme Court case is Mathena v. Malvo and will be heard when the court reconvenes in October.